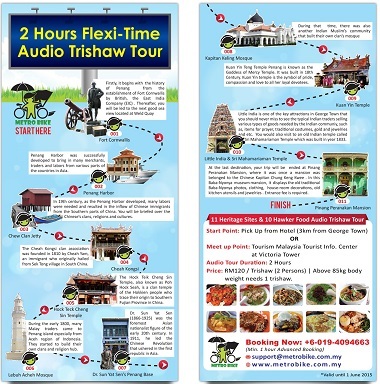 2 Hours Heritage & Food Audio Trishaw Tour package is catered for the time flexibility of the travelers to explore George Town by trishaw with an English audio tour guide device. We provide complimentary hotel pick up by trishaw within George Town areas for a distance not more than 3km from the heritage sites. 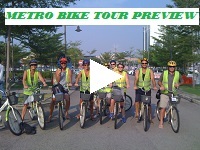 This audio trishaw tour package comes with a twin-share trishaw, an audio guide device and heritage trail maps. 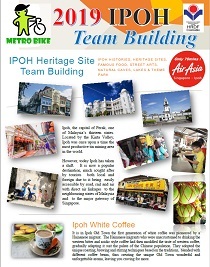 It would take about 2 hours for the heritage sites exploration. 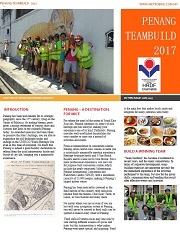 Firstly, it begins with the history of Penang from the establishment of Fort Cornwallis(1) by British, the East India Company (EIC) . Thereafter, you will be led to the next good sea view located at Weld Quay i.e. Penang Harbor (2) and its commodities trade. All these would be explained in the contents of the audio guide. 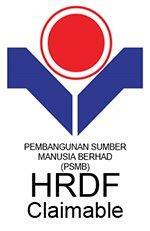 With the good governance of British administration, Penang Harbor was successfully developed to bring in many merchants, traders and labors from various parts of the countries in Asia. As part of British’s colonial key strategies in ruling the foreign land, the “ Divide and Concur Model” was applied and it can be easily traced in George Town heritage city. There are 3 major race groups which comprise the Chinese, Malay and Indian, they were being separated apart by their living habitats in George Town . During the early 1800, many Malay traders came to Penang island especially from Aceh region of Indonesia. They started to build their own clans and religion hub at Lebuh Acheh Mosque (6) . During that time, there was also another Indian Muslim’s community that built their own clan’s mosque at Kapitan Keling Mosque (8). Little India is one of the key attractions in George Town that you should never miss to see the typical Indian traders selling various types of goods needed by the Indian communiy, such as, items for prayer, traditional costumes, gold and jewelries and etc. You would also visit to an old Indian temple called Sri Mahamariaman Temple (10) which was built in year 1833. At the last destination, your trip will be ended at Pinang Peranakan Mansion (11), where it was once a mansion was belonged to the Chinese Kapitan Chung Keng Kwee . In this Baba-Nyonya museum mansion, it displays the old traditional Baba-Nyonya photos, clothing, house-room decorations, old kitchen utensils and jewelries . Entrance fee is required. If you wish to extend the trishaw tour services beyond 2 hours, you are advised to ALERT the trishaw man. Surcharge is applicable on hourly basis. Penang hawker food has been widely recognized for its unique inherited delicious ingredient. 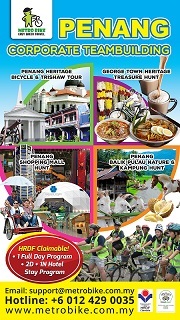 The audio guide contents cover 10 famous hawker food in Penang not only on where to locate and also explaining about the food origin, ingredients and the taste assessment of by the local.